Kikagaku Moyo/ 幾何学模様 is one of our absolute favourite bands here on Psych Insight/ Backseat Mafia. The group’s last two albums made our ‘Essential’ list in 2014, and we have been wowed by their exciting live performances,. As a result the levels of expectations for a new album are sky high, and went up a notch when we featured the lead track from the album, ‘Kogarashi’ on a recent playlist. I can say right away that the album has more than met expectations, but it is not what I expected. 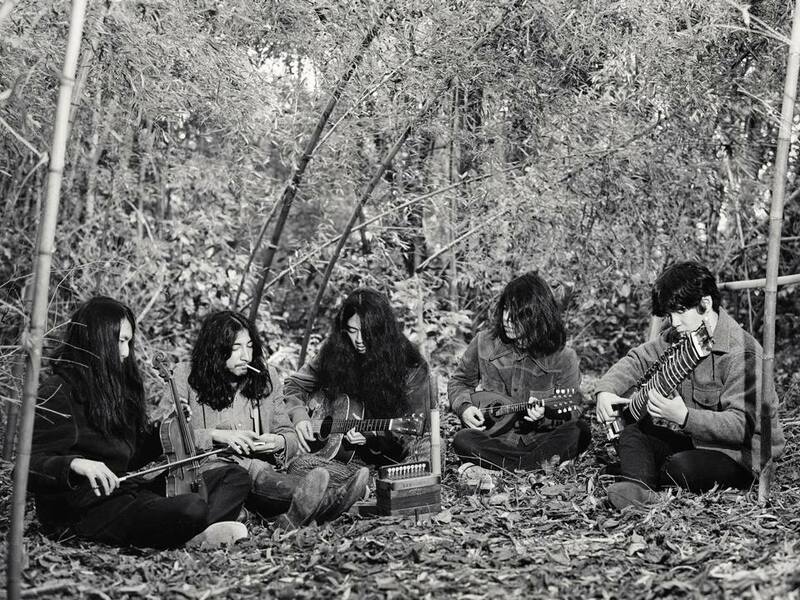 While previous albums have veered more towards the experimental side, in that great tradition of Japanese psych that is writ large in the Guruguru Brain (the record label run by members of the band) compilation Guruguru Brainwash; ‘House in the Tall Grass’ is a far more luscious proposition, as ‘Kogarashi’ had suggested. Make no mistake this is an absolutely amazing album, but it represents a shift in Kikagaku Moyo’s approach to something more accessible, an album that goes with the grain far more than its predecessors. Getting into the set itself, the nearly eight minute opener starts as if nothing has changed with a cacophony of noise, which quickly drops into a beautifully melting melody with smooth harmonies and a glorious baseline lurking just underneath. This is the first of many tracks on this album which have the sonic effect of a relaxing massage, the vibrations passing right through you in a manner that is invigorating rather than somnolent. This puts you just in the right place for the aforementioned ‘Kogarashi’ which takes that beauty to a whole new level. This is an utterly enchanting track that seems to become more beguiling with every listen. ‘Old Snow, White Sun’ has a certain bleakness to it suggesting, as the title alludes to, a changing of season; a track perhaps of old joys and new possibilities. There is sadness in this song, yet there is also more than a trace of hope as the etherial vocal finds its way through the acoustic guitar, indistinct keyboard and buried rhythms. A thought provoking and well worn song, the same of which could be said of ‘Melted Crystal’, which seems to occupy the same sort of conceptual space. A slow, simple and repetitive track that does not develop very far but almost imperceptibly builds up in the mind to create sonic pictures of loss and longing. ‘Dune’ is a short and more uptempo instrumental that cleans the musical palate before ‘Silver Owl’, a beautiful ten minute track that once again mixes alluring melodies with arresting harmonies to create something that is for the most part fragile and vulnerable yet towards the end breaks out into something altogether more substantial and confident with some well-placed wah wah guitar imposing itself over more acoustic element to great effect. This take the track home in a way that does not comprise the earlier beauty but really giving it a strong and powerful finish. Following the interlude of ‘Fata Morgana’ comes ‘Trad’, which I would probably describe as the most psychedelic on the album. Again the combination of music and vocal harmonies is near perfect providing an atmosphere that is both etherial and graceful before the track really breaks through to another level recalling some great experimental psych bands of the past (and perhaps the ‘Trad’ of the title is a reverence to ‘Trad Gras Och Stenar’). The album ends on a real high with ‘Cardigan Song’, a track that feels as comfortable as it is brittle. This feels like a tradition song found in an old box; but does not feel old, nor is it like a folk song in the traditional sense.In a way, though, it helps me understand what his album means to me. It strikes me that through the music on this record Kikagaku Moyo have developed something that feels warm and comforting. There is nothing here that is particularly challenging or difficult to hear, rather it is an LP that coaxes out our emotions through empathy rather than provocation. It is, as I said near the beginning, an album that goes with the grain. It is an album of consummate beauty and, while a departure from their recent albums, is quite possibly the band’s best work to date. ‘House In The Tall Grass’ is available for pre-order now at the Guruguru Brain bandcamp page here, and is released on 13th May 2016.